Luis Royo takes on the Dark Knight! Based on the illustrations by the famed artist. 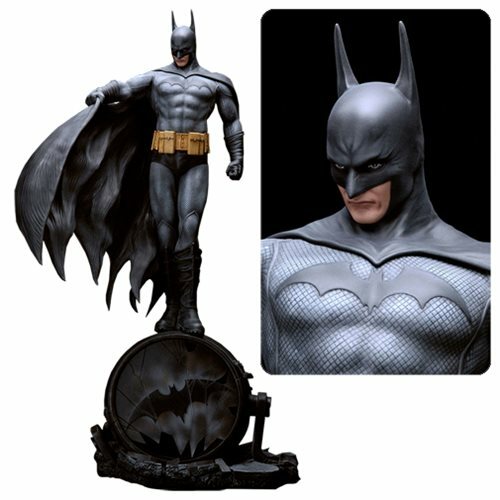 Imposing statue of Batman measures 21-inches tall! The Caped Crusader stands atop a shattered Bat-Signal, surrounded by rubble. Batman stands ready to do whatever it takes to protect Gotham in this imposing Fantasy Figure Gallery DC Comics Collection Batman by Luis Royo Resin Statue. Based on the illustrations by famed artist Luis Royo, the Caped Crusader is featured in his dark gray suit with his cape in hand. Overlooking his city, he stands atop a shattered Bat-Signal, surrounded by rubble. This astounding statue measures about 21-inches tall from head to the bottom of the base. Batman alone stands 14-inches tall, while the base measures 7-inches tall. It's big! Ages 15 and up.